Exploring the life of the author who created a legendary character known around the world while living in Oak Park and Chicago's West Side. This exhibit at the Historical Society of Oak Park and River Forest, tells the story of Edgar Rice Burroughs, the writer who created Tarzan and fantastic tales of science fiction. Born in Chicago, Burroughs unsuccessfully pursued a series of careers until he was 35 years old: soldier, cowboy, salesman. (See the online biography.) It wasn't until his Oak Park years, between 1910 and 1919, that Burroughs became a successful author. His first Tarzan story, "Tarzan of the Apes", was published in 1912. Also reknowned for his writings including John Carter of Mars books, magazine stories, and other published works, Burroughs captivated many children and adults alike with his imaginative tales. Today his legacy lives on in print, film, video, other media - especially on the internet. His ERB, Inc. created one of the world's first multimedia merchandising empire. Readers, viewers and listeners of all ages will experience his marvelous imagination and creativity as they enter into his fantasies which come to life in the exhibit's displays. memorabilia, movies and radio presentations. Pictured above is Johnny Weismuller, a popular actor who starred in the role "Tarzan, the Ape Man" (1932) and many other Tarzan movies. These are considered the finest of the Tarzan movies. 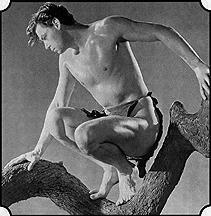 There were many more Tarzan's though; do you know them all? Weismuller is famous for another American cultural icon - click on the picture to find out what! The exhibition is located on the second floor of the National Historic Landmark Pleasant Home, located at the corner of Pleasant Street and Home Avenue in Oak Park, Illinois. Need travel directions to the Pleasant Home? Regular hours for the exhibit are 11:30 AM to 3:30 PM, Thursday through Sunday. Additional times are available for groups - please call (708) 848-6755 for more information or to make arrangements.